Delicate and subtle aren’t words typically associated with razor-sharp, in-your-face, thrash masters Annihilator. But they are definitely appropriate when talking about the latest project by the Canadians led by Jeff Waters, Annihilator’s singer-guitarist-producer-business manager, undisputed all-around mastermind. “Triple Threat,” which was released on Jan. 27, is a 2CD/DVD package whose centerpiece is a live acoustic session spanning the band’s 30 plus year career. Waters and company perform stripped-down versions of fan-favorites including “Phoenix Rising,” “Good to Me” and “Stonewall,” as well as excellent renditions of “Snake In the Grass,” “In the Blood” and more. The third part of the threat is a mini-documentary. 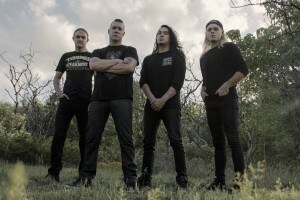 In addition to footage from the band’s 2016 summer tour, there are interviews with Annihilator band members, admirers including Chris Jericho of Fozzy and Megadeth’s Dave Ellefson, and a trip to Waters’ hometown in Ontario. He also answers fans’ questions, including which are his favorite, least favorite and most underrated Annihilator albums – no spoilers here! We recently rang up Waters at his home oustside of Ottawa. Had you wanted to do an acoustic performance for a while or did the idea come recently? 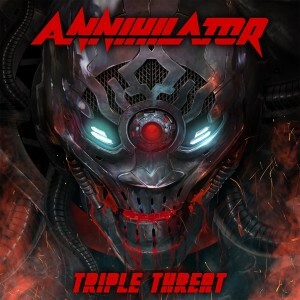 We weren’t planning on it but the label called up in December 2015 and our guy asked if I wanted to do something really cool to go between our 15th and 16th albums – Annihilator’s last studio album, “Suicide Society,” was released in 2015. He said, ‘let’s think of what to do for a fan package.’ I remember when the last Van Halen CD, “A Different Kind of Truth,” came out, it had a bonus DVD of the band performing some songs acoustically. The idea of doing an Annihilator live concert and another disc with a live acoustic session blew my mind. I thought, if we had a few extra musicians and someone to help with vocals come into my studio, and just go back through some old songs, a few people in my fan base would want to hear it. How did you choose which songs to give the acoustic treatment? Most were the melodic songs that we’d done, that already had acoustic parts or were ballads. The exception is “Stonewall,” which we altered a little bit since it’s a heavy song. There are a couple songs that were written about your son: “Innocent Eyes” and “Holding On.” Were those especially emotional to perform? Yes, especially “Holding On.” My parents and son showed up in the studio out of the blue to say hello when we were recording it. I couldn’t look at them while we were playing. Which were the most challenging songs to pull off acoustically? With “Phoenix Rising” and “In the Blood,” the guitar chord patterns are repetitive. Anyone can play them for 20 seconds but it’s a real challenge putting the pressure on your fingers over the course of the entire song. How did it feel watching rock magazine editors, guitar company owners and fellow metal musicians like Dave Ellefson of Megadeth singing your praises in the mini-documentary?